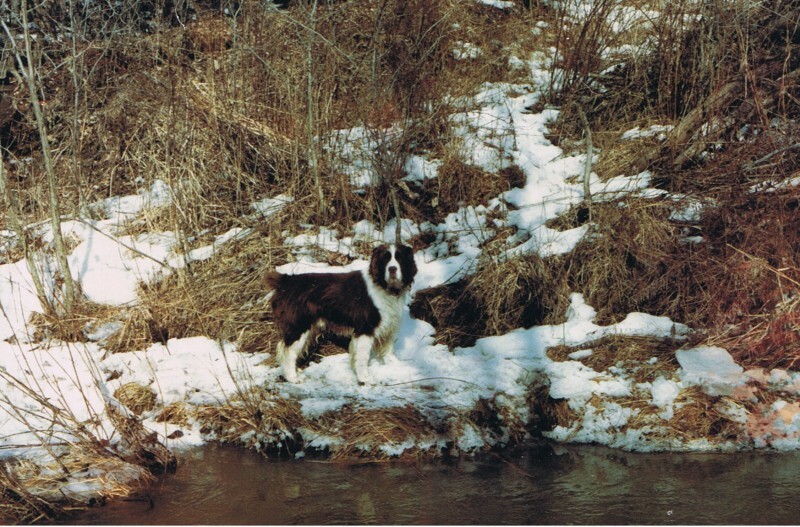 The founders of Carhan Springers, Scott and Maggie Fraser bought our first Springer, Ben, in 1983 for Christmas. We wanted a family dog that would be quiet, gentle and good with children and our Vet recommended the Springer breed. We were so pleased with Ben, he was everything that we wanted and more. When friends of the family found that they were too busy for their Springer, Nellie, they gave her to us and the rest is history. Many years and many dogs later we have developed a line of Springers that are "The Perfect Family Dog"! Our dogs are quiet and gentle with great people skills and great health and genetic characteristics. We raise our dogs on our 50 acre farm just outside of Sarnia, ON. Our farm is dog paradise, there is lots of room to run and a creek that flows around three sides of the property. Not to mention the critters to chase! We have warm barns for the dogs to sleep in if they don't want to be in the house with us, which isn't very often. You can often hear Scott muttering "50 acres of ground to run on and they choose the square foot that I want to step on next!" They just love to be with us.